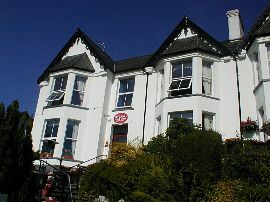 Bryn Bella Guest House in the Snowdonia National Park, has 5 en-suite bedrooms offering comfortable bed and breakfast accommodation in Betws-y-Coed. 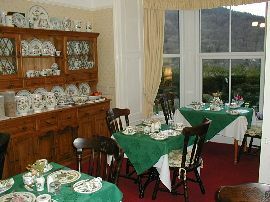 This non-smoking guest house overlooks the village of Betws-y-Coed, and offers B&B with many comforts and facilities. There is ample private parking, which is at a premium in Betws-y-Coed. 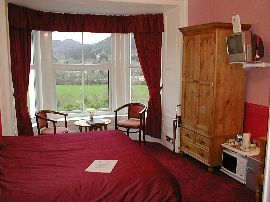 Every effort is made to ensure that you enjoy your stay with us in North Wales. 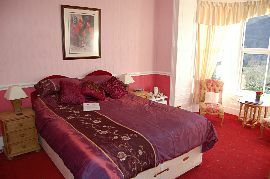 All rooms have hairdryers, fridge, microwave, electronic safe, tea & coffee facilities as well as DVD players and WiFi access. WiFi is also available in public areas, as is a computer for checking e-mail etc. It's an ideal location for a holiday or short break in Snowdonia or North Wales. Bryn Bella is set in a quiet location overlooking the village, but you can also enjoy the convenience of the shops and places to eat in Betws-y-Coed that are close by. 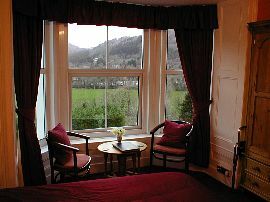 There are numerous things to do and see around Betws-y-Coed. It is the perfect base for many activities including walking and mountain biking. Bryn Bella has been awarded the Green Dragon Environmental Award in recognition of efforts made to minimise it's impact on the environment. You can check availability or make a booking using the online booking facility on Bryn Bella's own web site - see link at the top of the page. We use fresh local produce daily as well as our own free range eggs. We are set 1 mile away from Village Centre with allocated drop off and parking space opposite the entrance. Orange Mobile phones can be accessed within the house. All other networks are unable to obtain signals within the rooms but may be used within the local area. A payphone is available in the reception area. Fruit juices - grapefruit, orange, pineapple. Eggs are fresh daily from our own Chickens. All our meats are from local Welsh sources. If you have any special dietary requirements (e.g. gluten-free (coeliac) or vegetarian), please advise us on arrival. Smoking Facilities: Smoking is not allowed. Non Smoking Throughout. Follow signs towards Betws-y-Coed along A470. Before you reach Betws-y-Coed you will see a Sign for Bryn Bella on the left hand side. Turn off A5 onto A470 after the Ty Gwyn restaurant. Follow A470 for 1 mile and bryn Bella is sign posted on right hand side. All prices include VAT/local taxes. January, February, March, November, December (less Christmas, New Year and Bank Holiday weekends which will be charged as High Season). April, May, June, July, August, September, October, Christmas, New Year and Bank Holidays. For cancellations within a month of the booking date payment is due in full for the period booked. If the accommodation can be re-let then a refund will be made for those days we are able to occupy the rooms.